Marquetry in America has won itself an incredible amount of interest among its populace. It has been gaining ground over the last few years and has now begun to be adopted as an art medium in its own right by many American artists. "How I Was Introduced to Marquetry"
Today, among California's brown hills, when I look at this picture, images of tea cozies and rose gardens in a world of green come to mind but as a child it was a different story. Life was very conservative in our tiny English village in 1940 and the old adage "children should be seen and not heard" was both taken seriously and practiced. For a young boy with a restless body and an active mind, it was like purgatory to spend an afternoon visiting relatives, having to sit up straight and still on a hard straight backed chair. In my Aunts parlour, nothing but dreary adult conversation, while outside I could hear the crack of a willow bat on hard leather and the excited yells of the village lads was like salt in a wound. However discipline was strict and punishment severe, so I had to sit quiet and still, only my eyes could wander round the room but my mind could wander anywhere it wished. It was on one of those painful afternoons that I became aware of a small insignificant picture on the wall of my Aunt's parlour. 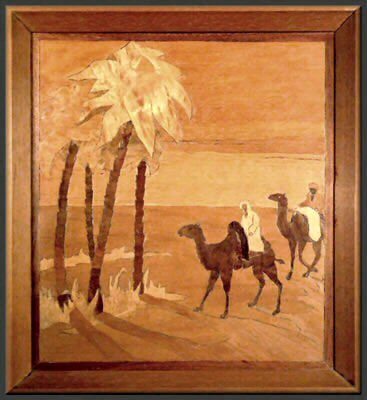 It included camels and palm trees and seemed to suggest a sunset in a faraway desert. As I gazed at the picture I could let the adult conversation float by me but these were the war years and the names of exotic places would sometimes catch my ear. At eight years old I had never travelled beyond my green English village, for me it was that small picture that represented all the exotic wartimes names I was hearing. I would stare at the picture and forget the adult chatter, I would even forget about the cricket match going on outside and my mind would travel with dark skinned men in flowing white robes, riding camels through distant deserts; my childhood fantasies fed by names like Mesopotamia, used that picture like a window to escape through. Years later my work brought with it the opportunity to travel. I returned from each country, I visited, to my green English village, with a small gift for my Aunt and I would tell her how that picture had given me the urge to travel. She explained that my Grandfather has also worked all over the world and had made that picture out of wood. My Aunt never forgot my love of that picture and willed it to me; I keep it in a prominent place along with my Grandfathers watch, it will never be considered "fine art" or even good marquetry, it shows signs of techniques not fully mastered and has suffered the ravages of time but to me it is "good art". For me the measure of wether a picture is "good art" or merely a two dimensional image is if it stirs some emotion in the viewer. Even as a child my Grandfather's Oasis stirred some emotion in me and it still does. To see the pleasure in someone's eyes or to hear comments that leave no doubt you have stirred some emotion - if only in a small child - is worth more than a whole room full of blue ribbons. Show your work! Experience it for yourself. The next item is by that well known Marquetarian Robert Swanson who comes from Colorado. 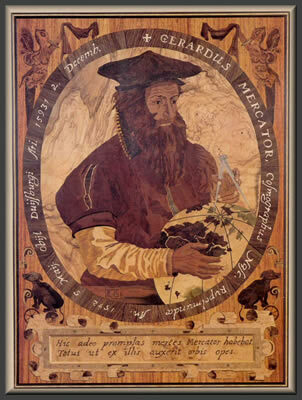 "As a professional cartographer / photomapper, I'd always been interested in Gerhardus Mercator who was a Flemish mathematician, geographer and map-maker of German extraction. I took note when the Library of Congress announced a special exhibition of atlases in the mid-80's. 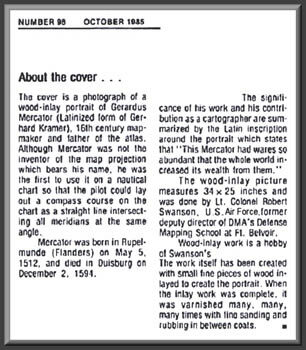 The affair was publicized in the Washington Post and was illustrated by a one column-wide etching of Mercator, who has been credited with the original idea of the atlas. 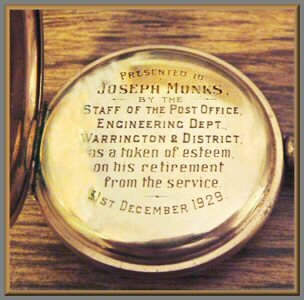 I used that little etching as the basis for my marquetry picture. It was actually a "projection" which has since borne his name, that was first used by Gerhardus Mercator in his map of 1568. " Craig Thibodeau from San Diego, CA has, over the last few years, become a name very familiar to everyone who attends our National exhibitions and who looks through our National Exhibition Gallery pages. Craig specializes as a furniture maker of bespoke purity and seasoned craftsman quality. Woodworker West magazine has just published an article featuring Craig. We are very pleased to be able to include a special Gallery page to this section of the web site. Dave Peck is a superb practioner of applied marquetry and has kindly sent us some excellent examples of his work. As we know that you are going to enjoy Dave's marquetry as much as we do, we have placed Dave's applied marquetry works on their own page for the very best clarity. Just select Dave's button below.